Since I started writing The Fountain Avenue Kitchen newspaper column and blog, I have had the privilege of meeting some truly fascinating people. I’m not referring to big name chefs or foodies either. I am talking about real people, just like you and me, who have some very interesting stories to tell. All of the stories are not food related, although this one is. A couple of months ago, I read an article in our local newspaper about Phil and Laura Lapp. After the couple’s two daughters declared they would no longer eat meat, Laura began searching for ways to incorporate protein into their diets. After beans and other high protein options were not well received–even when hidden!–Laura began to experiment in her kitchen. Coincidently, a few weeks after I read this article, I was introduced to Phil and Laura while in at a food expo Baltimore. A mutual acquaintance made the connection of our shared hometown. As Phil said, they never set out to start a food company. They were just trying to solve their family’s problem. But Laura’s kitchen experiments ultimately led to an all-natural, nut-based replacement for ground beef that her family loved. The taste was great and the consistency was spot on for favorite dishes like tacos and spaghetti sauce, burgers and chili. 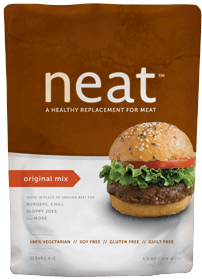 When I prepared “neat” the first time for my meat-loving husband and two sons, I was rather skeptical. Would a meat replacement have any chance of satisfying them? My 15-year-old’s quick remark after his first bite was not what I expected. He said he could be a vegetarian if he got to eat this all the time! While I told him this was not necessary–and he knew this wasn’t my aim–this was a very strong testament to the product Laura had created. I realized that this product could fill a big void for vegetarians and well as those who are cutting their intake of red meat for various health issues. The ingredients in the original mix (there is also an Italian and Mexican option) are PECANS, GARBANZO BEANS, GLUTEN FREE WHOLE GRAIN OATS, ORGANIC WHOLE GRAIN GLUTEN FREE CORNMEAL, SEA SALT, SPICES. That’s it! Just healthy, whole ingredients that are minimally processed; and neat is packaged right in our hometown of Lancaster, Pennsylvania. To the mix, one simply adds two eggs (or egg replacer for a vegan option) and sautés just like regular ground beef. Though my family did not have the same needs that the Lapps had–Phil also had elevated cholesterol that has dropped significantly since substituting neat for red meat–I have returned to the product on several occasions because it is a convenient, affordable pantry ingredient. When I recently forgot to take a pound of ground beef out of the freezer, I used neat instead….and everyone was more than happy with the substitution. 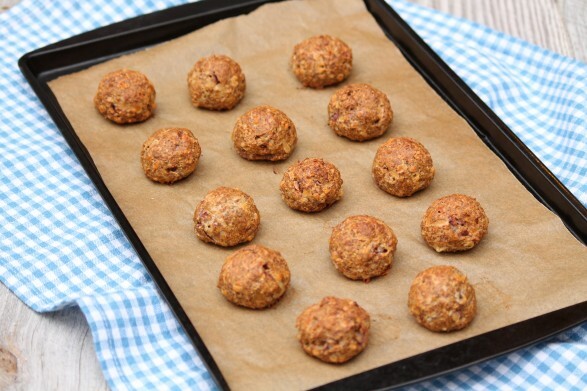 "Neatballs" can be prepared in minutes with minimal ingredients. Though I have varied the cheese and the dipping sauce several times, my family's favorite combinations are Mexican blend cheese with salsa and Parmesan cheese with marinara sauce. Of course, they are perfect for the traditional spaghetti and meatball dinner, too! 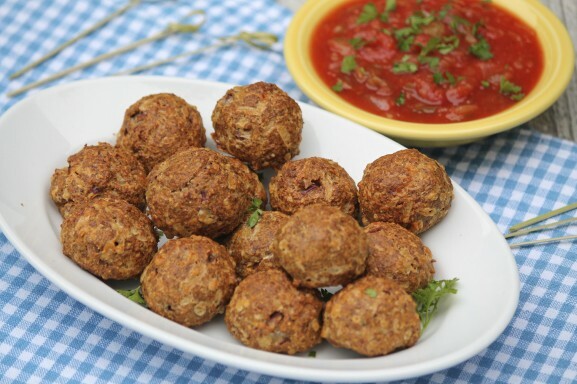 Yields 12 meatballs (may vary according to size preference) or 4 servings. Bake for 14-16 minutes. Serve immediately with desired dipping sauce or pasta. To learn more about Laura and Phil’s truly unique product and/or to purchase, click here. To say hello via their Facebook page, click here. Ann, I am excited about this! I have no intention of going vegetarian, but it would be so nice to have this alternative, especially like you mentioned, forgetting to thaw out ground beef from freezer. I am going to read about it and the family and hope to be able to find some somewhere locally! Although we are also a meat-eating family, I never considered the convenience of this product until I actually tried it. That combined with the taste and ease of preparation make it a really great pantry item. Hope you are able to find it locally! do you know where it is sold in Lancaster? Ann, do you know where it is distributed in Lancaster? So far, Stauffer’s and Lemon Street Market, Bernadette! And thank you for your thoughtful comments, Aya! Ann, I also notified the local organic produce and grocery service we have where I live (Cincinnati) to see if they might be interested in selling it, the company website had a link for that. I checked on Amazon and only kind availabel at the moment is the Mexican, the Italian and the original are not currently available. I think they were when I checked last week when I first checked so I think they sold out on Amazon. I can’t wait to try this. I am going to check and see if Whole Foods might have it. Thanks for the update, Mary Lou! It sounds like sales have been brisk, and I am sure they will be restocking soon. I do know that neat will soon be selling directly from its website, too. I hope you get to try very soon! Ann, I received my NEAT last week and I am going to make Neatballs tonight. I got the original and the Italian, and think I will use that to make the neatballs. Can’t wait to try it. It is a yucky rainy day here in Cincinnati and good Firday night to stay home. I will be certain to let you know how they turn out! It is a keeper Ann! We both liked it. Mine were a little dry and I noticed on package that it called for 2 Tbsp water for Italian mix, whereas I used just one. I might have left in oven too long. Nonetheless, we loved and I can’t to come up all different ways to use this product. Thank you for introducing your readers to it. So glad you tried and liked, Mary Lou! I do think if the “neatballs” bake too long, they have the tendency to dry out. Next time, reduce the cooking time a little and you should have no problem. I also like to saute as you would ground beef. I have another recipe that works very well and the leftovers are great for lunch…I will have to share that one soon!